That is a lovely snake Frank. 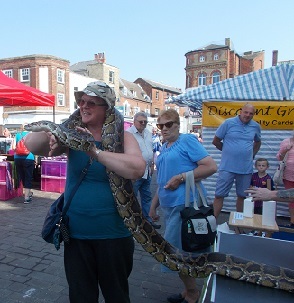 Large snakes like this don’t worry me, though these two were a lot heavier than I anticipated and I needed the table for support! One of the darts venues here has a collection of snakes and reptiles, but obviously we are only allowed to look, not touch. As kids, Sis and I had slow worms and lizards as ‘pets’, our grandad making an enclosure for them out of an old bird cage. We were little buggers and put the slow worms under the loo door when Mum was in there. She was not impressed and screamed that she’d kill ’em! This little anecdote was mentioned at her funeral, though it was implied that it was just Sis who did it, not the pair of us. 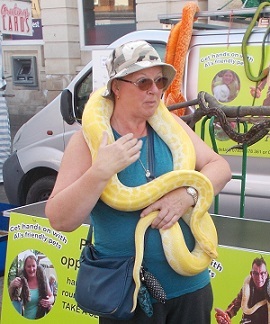 I had my picture taken with a python thirty something years ago at the Oceanarium in Poole. I can still see my Mum cringing in the corner wondering how I could just sit there and let this slimy creature wind itself around me. Actually, they’re not cold, slimy or slippery at all, and it was wonderful! You are a brave person. I wouldn’t have the guts to do that. 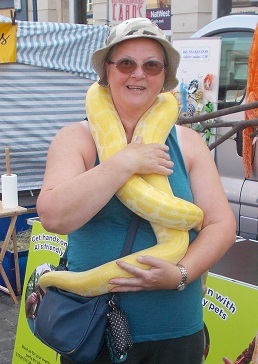 I confess I wouldn’t want a snake as a pet, but they do hold a fascination for me. Great story to go along with your photos (especially the escapade with your sister and the loo)! Ha, yes. Mum was not impressed and certainly squirmed a bit when I had my picture taken at the oceanarium. ha. No problems. Snakes just fascinate me.